As with all schools, Freegrounds Infants Governing Body, is made up of representatives of the Local Education Authority, parents, teachers, school staff and members of the local community. Helping establish the aims and policies of the school. and for Appointing and supporting staff. We are also responsible for overseeing the maintenance of the school buildings. We are involved in the strategic management of the school, supporting the headteacher and staff. Our aim is to help provide the best possible education for the children at the school, and we undertake regular training to keep up to date with new legislation and ideas. We have regular Full Governing Body meetings. The minutes of these meetings are available through the office. In addition, we have a number of working committees which also meet regularly. We all try to be involved in all aspects of school life - helping in school, attending fund raising activities and school functions, promoting the school, and we are all regular visitors to the school to ensure that what we are doing is effective and is having a positive impact on the school. We also produce a newsletter to let you know what we are doing. We are available to discuss problems or hear ideas, although if you have concerns about your child, please see your child's class teacher in the first instance or Mrs Riches. 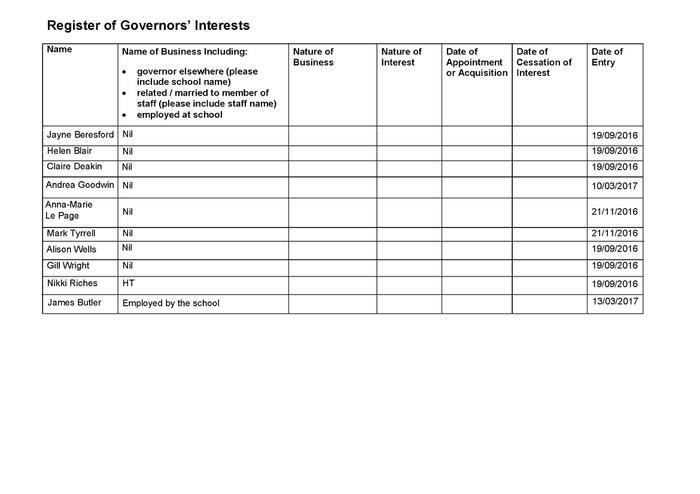 If you would like to find out any more about the work of the governors, or if you have any comments or suggestions, you can contact us through the school office, or catch up with us around school.